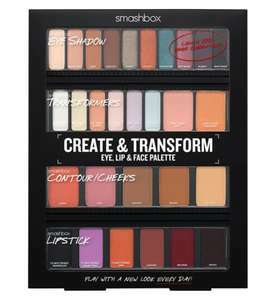 I normally like Smashbox, and I guess this is a good deal... but what on earth is going on with the colour choices in this palette? Especially the lipsticks?! I normally like Smashbox, and I guess this is a good deal... but what on …I normally like Smashbox, and I guess this is a good deal... but what on earth is going on with the colour choices in this palette? Especially the lipsticks?! The big Boots sets always go half price, does anyone actually pay £50-70 for these 'star gifts'? It's the good old 'triple the price then half it in the sale so people think they are getting a good deal'. So I would venture this was always earmarked to go half price and it's not to do with it selling badly. If anyone is considering this as a gift I'd suggest taking your £35 and buying one of the Urban Decay Naked palettes instead. It might look like less for your money but so much nicer. I ordered this on a whim for my 15yo daughter... yes I was sucked in by the fact it was half price. I read these comments and thought oh no what have I done. Collected it on Saturday morning saw the dark colours and thought I’d take it back this week. The box folds in half and you can take each of the 4 sections out. It is once out of the original card box a very nice looking package.